The renewal of the SYRIZA–Independent Greeks alliance is perhaps the most cut-and-dried aspect from the fallout generated by the somewhat unexpected results earlier this month. While many have questioned Alexis Tsipras’s honesty, in this election campaign he never disguised his desire to work again with the nationalist party and its leader Panos Kammenos. Kammenos returned to the Defence Ministry and Tsipras got his waiver to run the country as he sees fit, rather than a coalition partner who demanded a common policy programme based on which the prime minister would govern. In his first meeting with Tsipras the day after the elections, Kammenos carried a manila folder with him but it may as well have been empty. While the rekindling of his relationship with Kammenos may give Tsipras the only moment of laissez-faire their government is likely to produce, the alliance can certainly not be considered stable. While Kammenos runs a tight ship in terms of ensuring his MPs are loyal, Independent Greeks is never far away from conflict or controversy. The resignation of party MP Dimitris Kammenos over his racist tweets, just a few hours after he was appointed as deputy transport minister, was an instant reminder of the nationalists’ combustibility. There is an extra layer of uncertainty in this relationship because Tsipras is nowhere near as skilled as Kammenos in keeping his deputies in line when it comes to how they vote. After all, it was the tempestuous relationship between the prime minister and the radical faction of his party that led Greece to a second snap election this year. In theory, the departure of MPs from the Left Platform to form Popular Unity has stripped SYRIZA of its most cantankerous lawmakers and made the party more homogeneous. The so-called “53” movement, unofficially led by the mild-mannered Finance Minister Euclid Tsakalotos, is now the main faction within SYRIZA. The idea, though, that they will stand aside and let Tsipras have it all his own way is unrealistic. The “53” have already expressed their opposition to many elements of the bailout and are urging the government to adopt a “parallel programme” of alternative measures. The faction also flexed its muscle over the Dimitris Kammenos affair, when one of its members spoke of being “deeply ashamed” about his inclusion in the cabinet and called for the Independent Greeks MP to be removed. One also has to take into account that, since its founding, SYRIZA is a party that thrives on debate and disagreement. This was its lifeblood in opposition but may yet cause it to seize up in government. New Democracy is likely to reach SYRIZA levels of internal bickering in the next weeks after its current leader, Evangelos Meimarakis, launched a leadership contest following the conservatives’ unimpressive showing in the elections. Candidates have to submit their applications by 2 October, but the tension will build until the vote, which will possibly take place before the end of the month. There has already been an indication that candidates wanting to take the party in completely different directions will compete for the leadership. Former Administrative Reform Minister Kyriakos Mitsotakis was the first to step forward. He sees New Democracy as a liberal, reformist party but others, such as ex-Health Minister Makis Voridis, who is also expected to run, envision a party that is much further to the right. Such centrifugal forces could mean that although the party will have gone through a process of renewal at its highest level in the period of a few weeks, there may be great agitation in the ranks below. 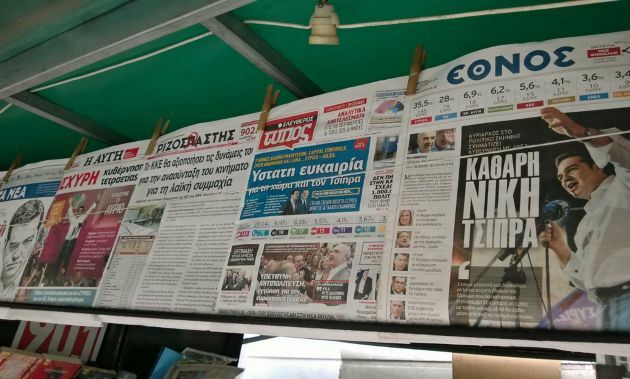 In contrast to its one-time rival, PASOK seems a picture of health after it increased its share of support and was the only parliamentary party to see its number of votes rise in the elections following an alliance with the almost non-existent Democratic Left (DIMAR). Under the affable Fofi Gennimata, PASOK can again try to claim a central role in the regeneration of Greece’s centre-left. However, a closer inspection of PASOK’s results shows that although its votes increased by about 52,000, this was only a fraction of the 30,000 ballots cast in favour of DIMAR in January and the 152,000 that went to George Papandreou’s Movement of Democratic Socialists eight months ago. The former prime minister’s party did not run in Sunday’s elections. Perhaps, though, a more significant obstacle to the revival of the centre-left is that centrist Potami has rejected the idea of cooperating with PASOK, despite seeing its support slip by 2 percentage points to just 4 percent on Sunday. Instead, Potami leader Stavros Theodorakis has called a congress for early December to discuss where the party went wrong in the campaign. A reconstituted centre-left that could attract disgruntled New Democracy voters if their party takes a turn to the right, as well as disenchanted SYRIZA supporters if the leftists fail to show any appetite to break with the compromised practices of the past, could become a force in Greek politics. But we are a long way from that point. Potami has to go through its period of existential angst, while PASOK will struggle to convince that it can be at the heart of anything that claims to be new and dynamic. A simple look at the 17 MPs the socialists elected is enough to see that the party has been reduced to a small collection of stalwarts. So, what the latest ballot has left us with is with a strange governing coalition that is prone to bouts of neuroses and an opposition that is likely to be too busy navel-gazing to be any use in facing up to the challenges ahead. Extracting some stability out of this morass will be some feat. *Nick is the editor of MacroPolis. You can follow him on Twitter: @NickMalkoutzis. This article was published in last week's e-newsletter, which is available to subscribers. More information on subscriptions is available here. The political reality is that ND+Pasok+Potami (the 3 stooges of Greek politics) are trapped into unconditionally supporting all Troika (or Quadriga) induced measures requiring their vote in Parliament. As such they have become impotent political forces whose voting blocks are taken for granted.